The museum is perfect for a visit any time of year. There are lots of activities for children of all ages, and a safe enclosed garden for children to play in. “The neatest spot on earth – all there is garden.” William Cobbett describing Farnham. Farnham is a town of outstanding Georgian architecture and a designated town of craft with a lively and artistic atmosphere. The museum aims to reflect this in a varied programme of exhibitions and events for adults and children alike. 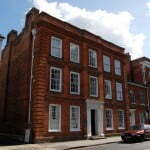 The museum was founded in 1961 to provide the Farnham community with a collection dedicated to the history of the local area. The elegant Grade I listed Georgian townhouse retains many original features, including a beautiful walled garden perfect for picnics. Displays include items from a large and eclectic collection; from archaeological artefacts to nationally important artworks by local artists and an extensive costume collection. The museum holds three major exhibitions per year which aim to please and surprise, from artistic collaborations to exhibitions designed for children and families. 9. Join the hunt for the hundred year old biscuit! Audio guides, tours and children’s guides are available. A modern community venue for the town. The beautiful garden gallery in the museum garden is available for parties, conferences, exhibitions and weekly courses. The gallery is self-contained and consists of a entrance hall, a main area, kitchen and toilet (disability accessible and baby changing). The building is fully wheelchair accessible and can accommodate up to 80 people. It is available for hire throughout the week, including evenings and weekends. 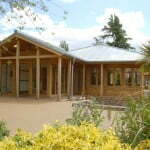 Wheelchair access to ground floor, shop toilet, Garden Gallery and garden.